On many ranches in the American West, cowboys head up to a cow camp, usually located in a higher elevation than the ranch headquarters, for the summer. In Summer Cow Camp 101: Living Situation, I gave a guided tour of a typical summer cow camp. Once a cowboy is settled into his secluded home-away-from-civilization, he takes care of cattle all day. This can include scattering bulls, changing pastures, putting out salt, doctoring cattle, sorting cattle, and fixing fence. Not included in directly taking care of cattle but equally important is taking care of camp. When living alone with no neighbors or power lines and questionable cell phone service, a person must learn to be self-sufficient. Making sure there’s ample fuel for the generator and beef in the freezer (and that the freezer is working) become top priorities. Whew! How does one guy (or gal) do this all alone? The same way a person would eat a massive steak: One bite at a time. Doesn’t that look delicious? 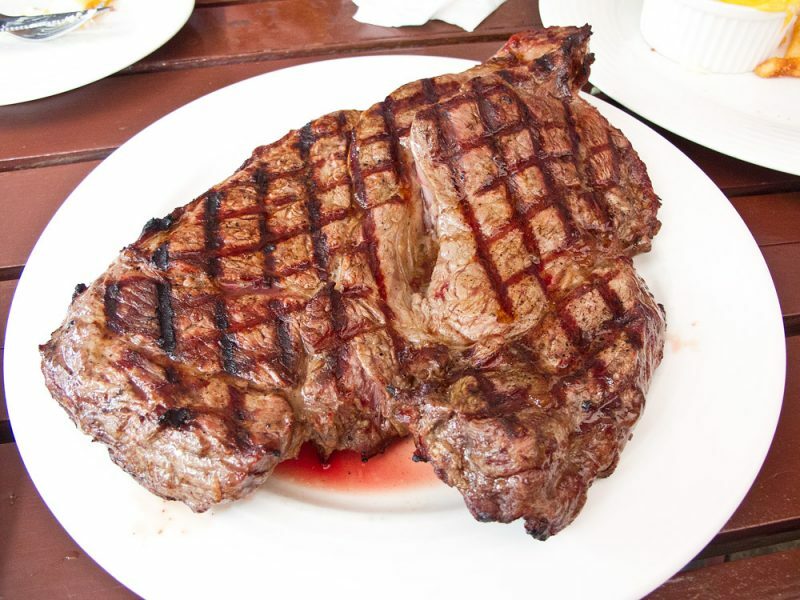 A cowboy at camp is unlikely to enjoy a steak of this magnitude, though, because his perishable groceries must fit in a small propane-powered fridge. Think chuck steak and a can of beans. Back to the cowboy’s workload. Some tasks, like putting out salt, are fairly easy to accomplish solo. To make sure cattle receive enough salt during the hot summer months, he loads up an ATV or a pack horse and transports this vital nutrient to the desired location. Checking cattle for sickness or lameness is fairly straightforward. He just saddles up a horse, grabs a syringe and a couple bottles of medicine, then rides around the range looking for cattle with runny eyes/noses; scraggly, unkept hair; a cough; a limp (which could indicate foot rot); or other signs of malaise. But, once he locates a sickly or injured bovine, how does he doctor it alone? He can head and heel the animal himself, a feat which requires a fair amount of multi-tasking and isn’t the go-to maneuver for most cowboys. Or, a cowboy can rope the desired animal around the neck, then ride up close and throw his slack in front of her in such a way that it lays her down, or “trips” her. This is NOT like steer tripping; it is done in a much gentler manner. Or, he can rope the animal, then tie his rope to his saddle horn so his horse can hold her while he dismounts and administers to appropriate medicine. 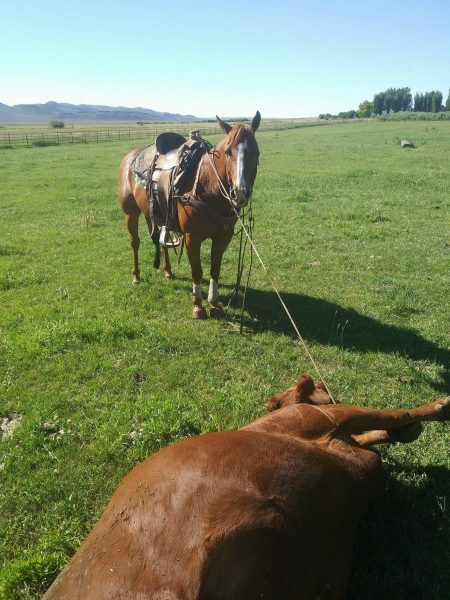 Here, a seasoned ranch gelding holds the rope tight for a cowboy working alone. Side note: This super-gentle 10-year-old bridle horse, “Cuchara Only Cash,” is consigned to the Van Norman And Friends Production Sale held in Elko, Nevada on September 15th. For more information, contact Jim Young at 775-385-9354. Okay, that about covers the doctoring and shameless sale promotion portions of today’s blog post. So, how does one cowboy working alone accomplish the rest of his tasks, such as sorting cattle and fixing fence? Slowly but surely. He must realize and accept that he is only one person and can only do so much each day. Embracing this fact will save his sanity and keep him from throwing his head back and screaming in frustration at the silent sky when the heifers crash the fence into the next pasture yet another time. Plus, if you’re summering in solitude in the mountains, you have to embrace some type of philosophical concept, right? It just seems to go with the woodsy, back-to-nature theme. So, the next time you’re faced with a monumental task with no help in sight, just think of the solo cowboy toiling away high up on some mountain at cow camp. Then go eat a giant steak, because it’s delicious and someone should enjoy the fruits of his labor.